John McAfee Wants to Get Back Into Silicon Valley, Without the TrafficHe’s flogging a new product. International Fugitive John McAfee Apparently Also Owned a Coffee CompanyIts signature brew is bonkers, with a bitter flavor. John McAfee Is Coming Home [Updated]The convoluted saga is headed Stateside. John McAfee Has Already Sold the Rights to His BiopicTo his publicist. John McAfee May Be in Guatemala for MonthsThe saga continues. 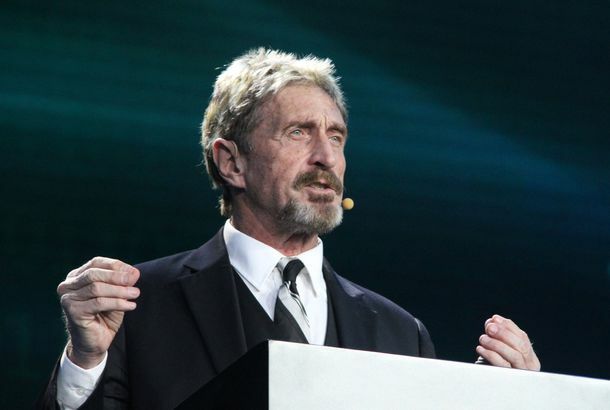 McAfee Denied Asylum, Hospitalized for Suspected Heart AttackIt was actually just stress. John McAfee Arrested in Guatemala, Keeps Blogging From JailAnd now he’s blogging from jail. John McAfee Emerges From ‘Hiding’ to Seek Asylum in GuatemalaAll his recent “misdirection” worked. John McAfee Just Hanging With Vice, Trying to Fake His Own CaptureThe spiraling anti-virus mogul says he’s safe. John McAfee Probably Not Captured in BelizeBut the authorities say that’s not true. John McAfee Blogs About His Many DisguisesHe’s now live-blogging his life on the lam. Prime Minister of Belize Reaches Out to McAfee, Tries to Put Things DelicatelyPolice aren’t trying to kill McAfee, or so says the PM. Wanted Bath Salts Expert John McAfee Hiding in a Box on the Beach [Updated]The security company founder says he didn’t murder his neighbor. Anti-Virus Founder John McAfee Wanted for Murder in BelizeHis life has been bizarre for a while now. The Times Blows Its Story on the Fall of the MegarichThey profiled one of the few megarich dudes that we actually kind of like.